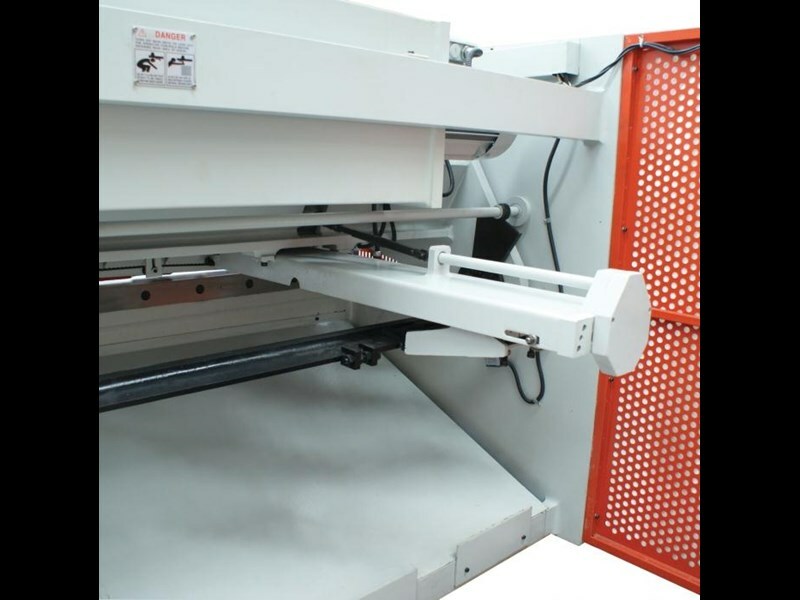 "CALL FOR OUR BEST PRICE"
MetalMaster Guillotines are manufactured in partnership with Hare and Forbes for a world wide market, they are used and accepted from first time users right through to established manufacturers. 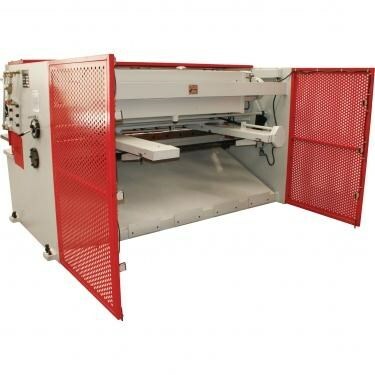 MetalMaster Quality Guillotines feature high durability, and provide precision shearing capabilities, The Guillotine main frames are constructed from rolled, stress relieved solid steel to prevent distortion during the shearing process and under extreme continuous loads. 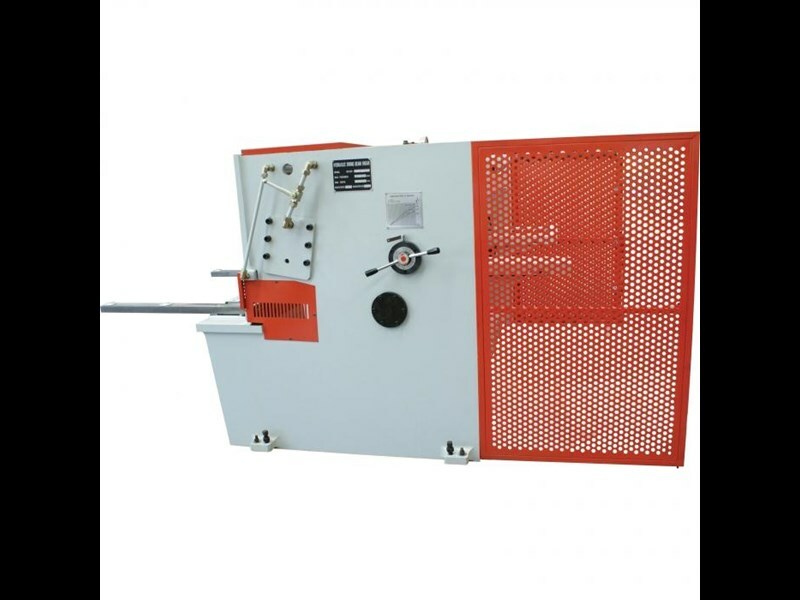 This heavy duty over driven style, fixed rake guillotine has been developed for shearing material from mild steel through to stainless steel due to the specially designed shearing blades with characteristics of 1. High resistance to wear, 2. High resistance to corrosion, 3. High resistance to impact & 4. High tensile strength. USA Hydraulic control valve unit supplied by Omega. 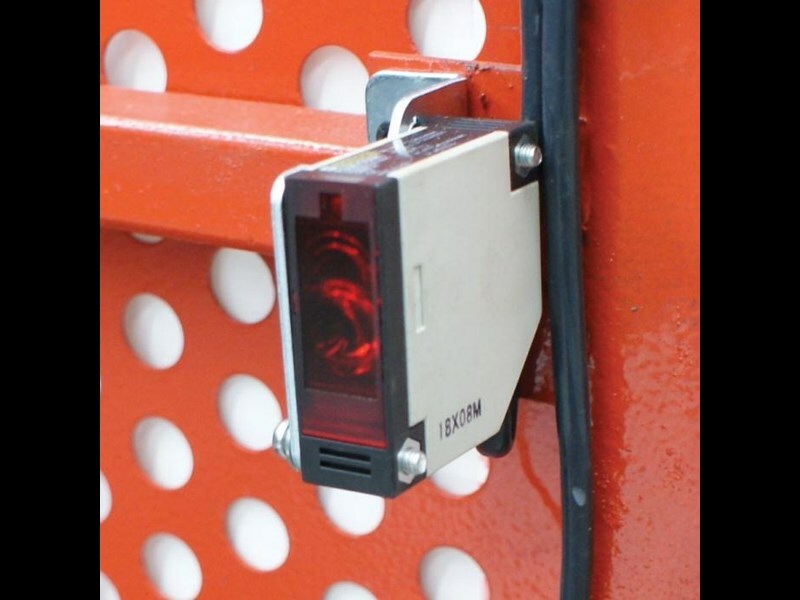 Ezy-Set NC-89 Go-To digital display controller provides up to 1000mm travel on the powered lead screw back gauge allowing operator to program the cut length required. 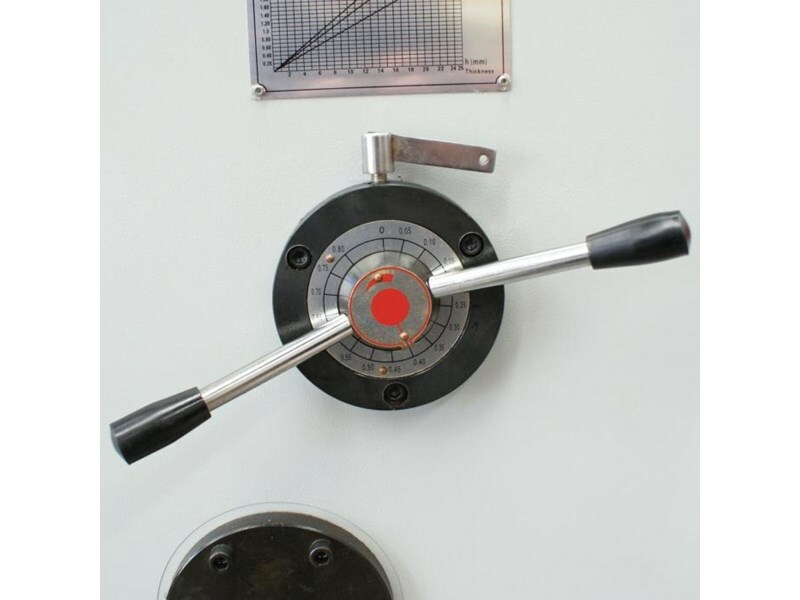 Also fitted is a stroke counter and stroke adjustment dial allowing shorter materials to be cut using a shorter stroke length, this feature will increase production. 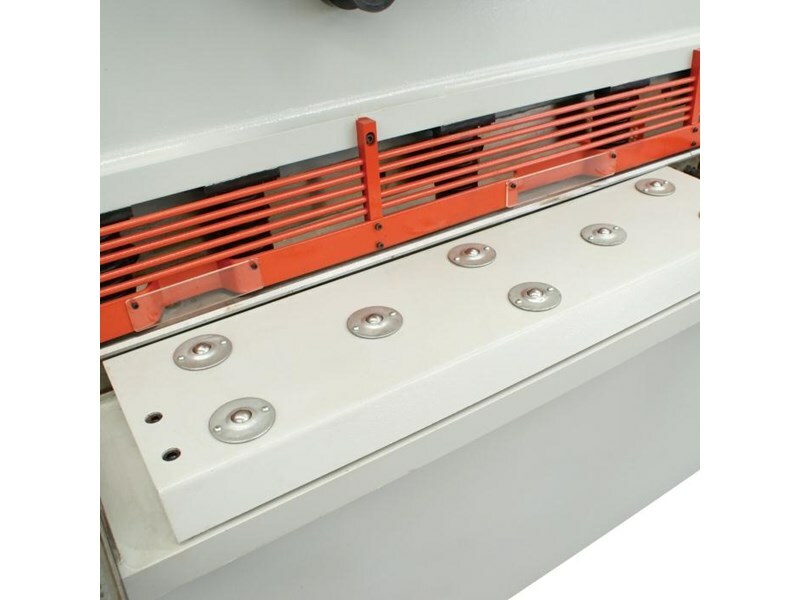 Control unit mounted on swivel pendant arm enabling operator to easily access the controller from the side, this is very useful when machine is loaded with full length of material. Top shearing blade made from Inox quality composite and has two (2) cutting edges allowing minimised down time in blade rotation. 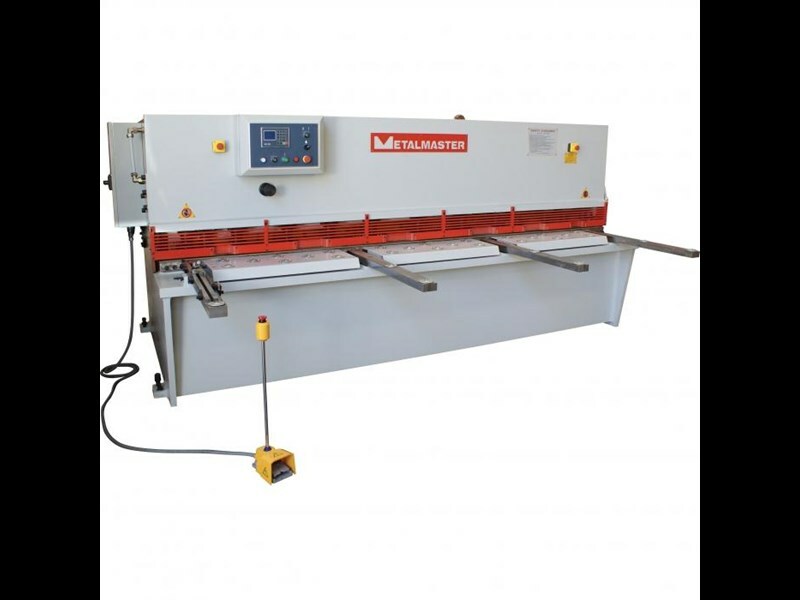 Bottom shearing blade made from Inox quality composite and has four (4) cutting edges allowing minimised down time in blade rotation. 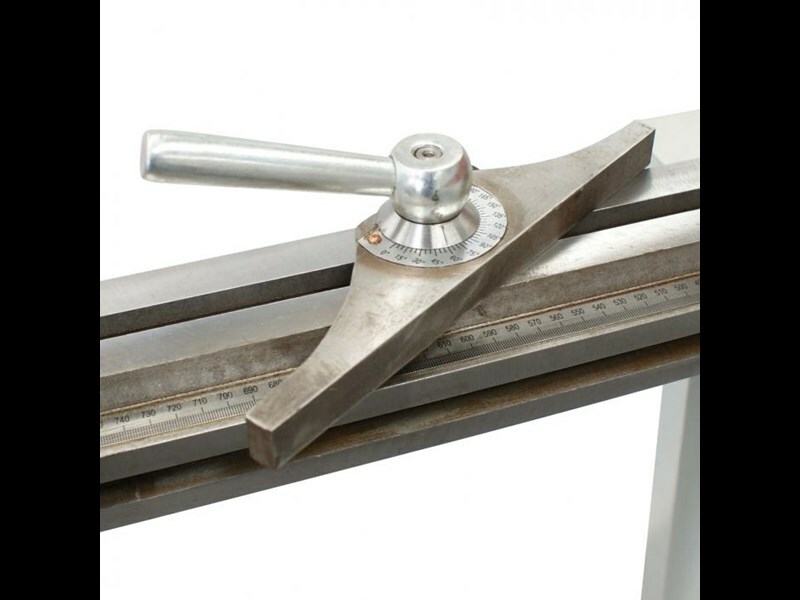 Heavy duty squaring arm is fitted with a graduated rule and adjustable flip up front stops and mitre Guide allowing operator to cut to measure from the front of machine. 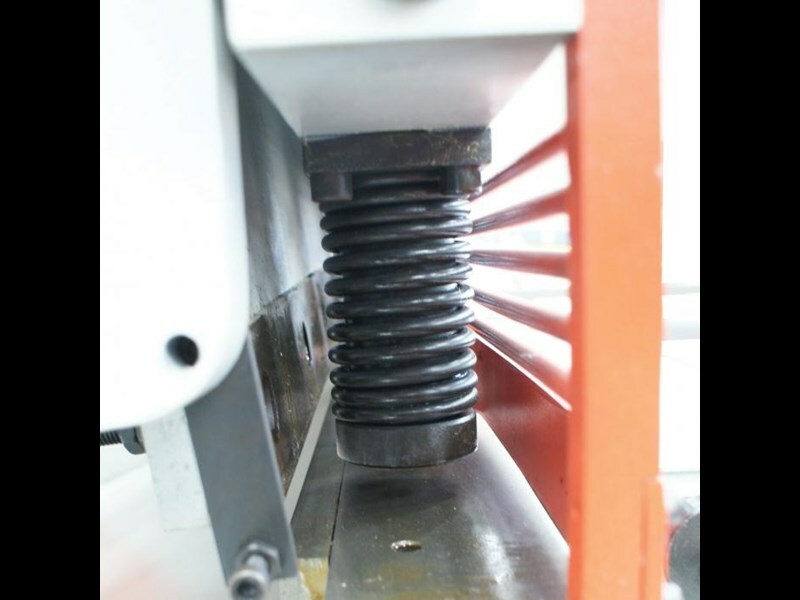 Flip over stops can be set to repeat cutting length required with accuracy. The arm also aligns the material to be located square to the cutting edge. Heavy duty over driven machine construction. 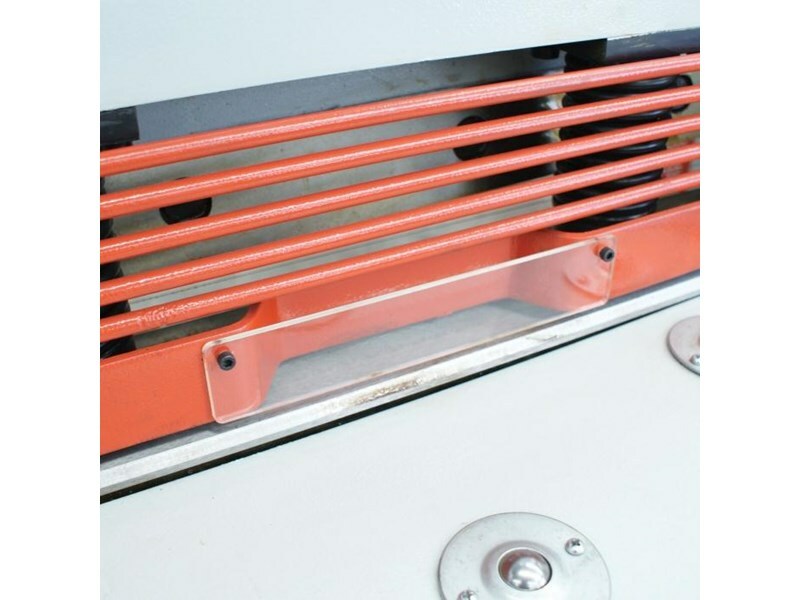 Emergency stops fitted on both ends of machine for additional safety. Individual hydraulic hold downs with nylon pads. 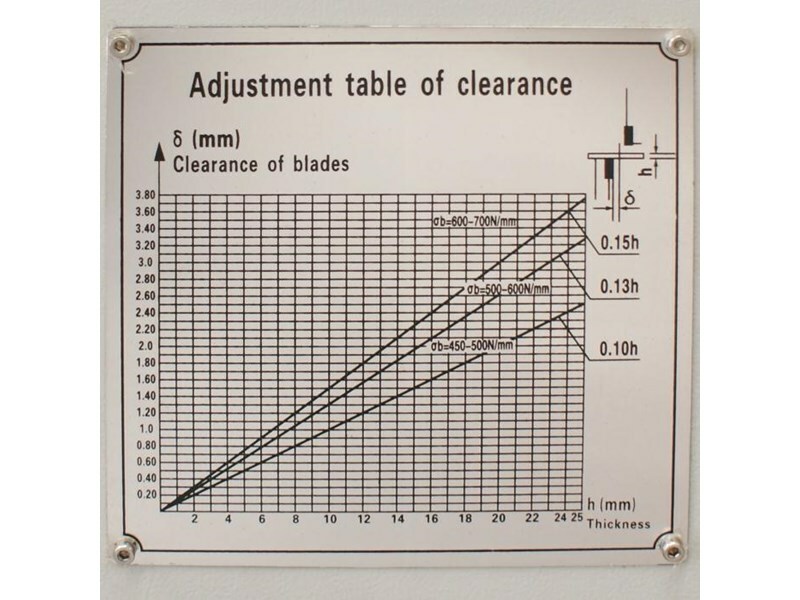 1000mm Ezy-Set NC-89 Go-To back gauge with fine adjustment. 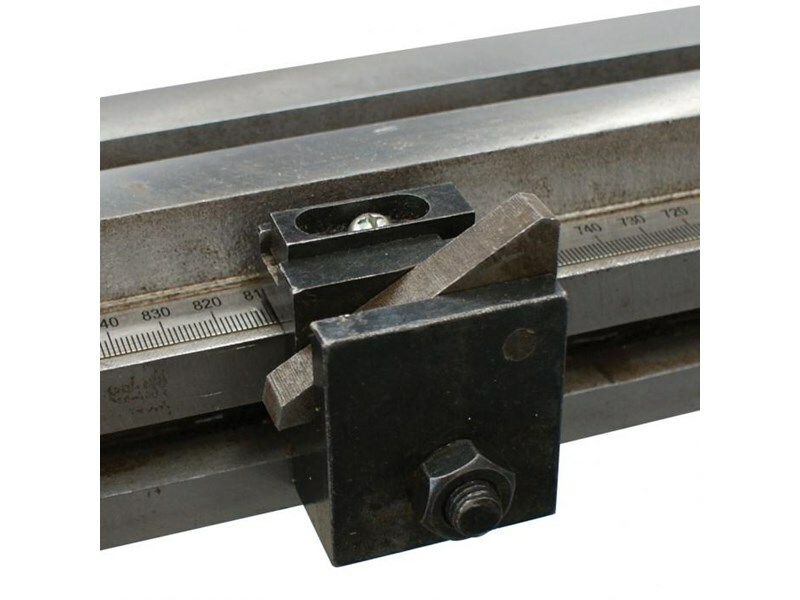 Swing away back gauge function for cutting long sheets. 4 edge quality INOX blade suitable for stainless steel. 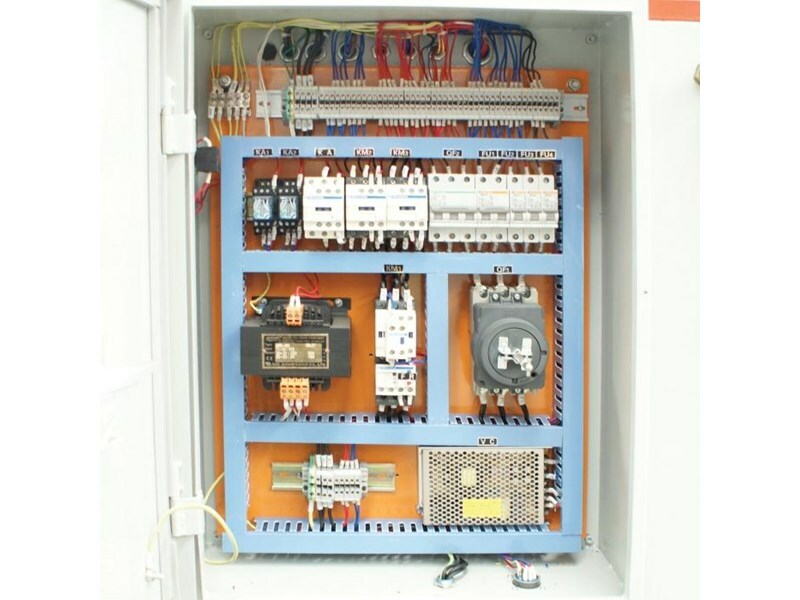 Omega OEM (USA) hydraulic valve system. Telemecanique & Merlin Gerin electrical components. Transfer balls on table & support arms. Heavy duty support arms and squaring arms. Stroke counter and short stroke adjustment. 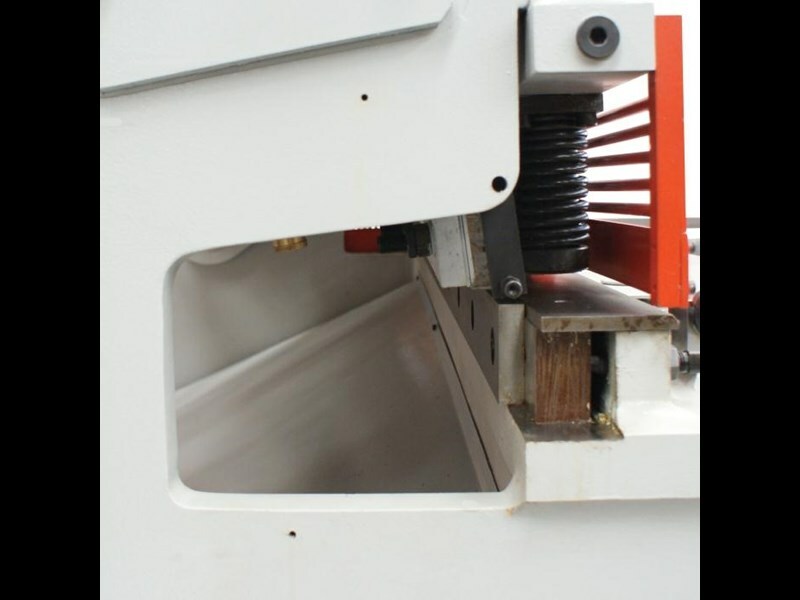 Sliding chute fitted, easily allowing operator to retrieve cut pieces. Three photo electric rear guarding. 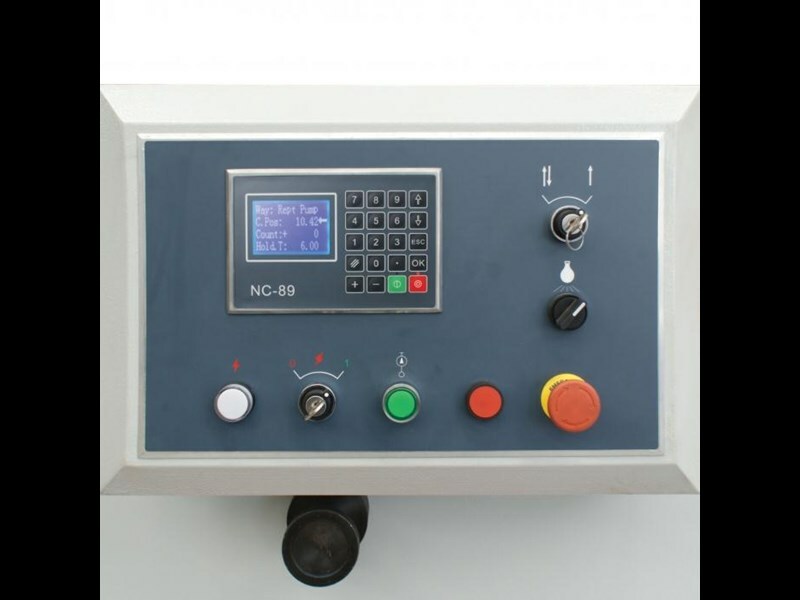 Ezy-Set NC-89 Go-To Programmable digital controller provides up to 1000mm travel on ballscrew backgauge allowing operator to program the cut length required.